The original, patented, and trademarked book by the inventor of the Heart Hand! The original book with the routines and positions for making hearts with the body! This is available for purchase on Amazon. 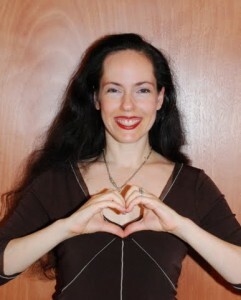 Artist Tali Lehavi invented the heart hand gesture, and then went on to name positions, movements, and entire routines. She was awarded a US patent and trademarked the heart hand gesture. This is the book that Lehavi first presented to the trade already in 2003! It is registered in the Library of Congress. To license the HeartMark heart hand, please contact talilehavi@aol.com. The book offers a variety of routines for different age groups and different parts of the body. Until recently, Lehavi was only making it available with teacher training and a licensing agreement, but she is now making the book available to more people. If you are an instructor, please contact Lehavi for support on how to teach the class properly and to maintain the integrity of the HeartMark trademark. We’re Dancing with the Stars!